Advances in modern technology can make our lives easier in many different ways, and this is no exception when we are faced with the prospect of moving house. 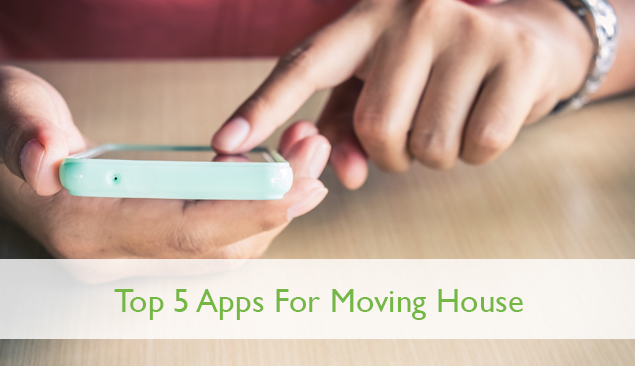 Even though this is just a selection from the many available, the top five apps recommended below offer assistance in a variety of different ways across the process; from making an inventory of your possessions to helping find out vital information about the area, such as location of banks and hospitals. The nation’s best known and loved property experts share tips about moving house, this app offers advice on a variety of matters related to this potentially stressful process, including moving considerations to guides on searches and viewings. Moving Van allows you to detail your possessions, taking photos of items and labelling boxes accordingly, in order to ensure you can easily search for, and find items on arrival at your new home. Make sure you keep track of your valuables with this useful app. inSured – Inventory My Property allows you to make an inventory of your possessions including recording of serial numbers, photographs, date and details of purchase and replacement value. This provides an important record of items which may be needed in the unfortunate event of loss or breakage. Explore your creative side by exploring your new home’s potential. This app allows you to see the different options available to you by mapping possibilities of how to utilize your new space, such as positioning of furniture. A full version of the app is also available if you wish to delve deeper. When you move into a new home you may be unfamiliar with the area and what it has to offer. The Around Me app allows you to discover key facts about the locality and can point you in the direction of banks, hospitals or other places of importance and interest. Other apps may prove to be useful to the new home owner, such as Spirit Level, to ensure that there are no more wonky shelves, or Broadband Tester and Cell phone Coverage Map, to check internet speeds and mobile phone reception at the new property. Dulux Visualiser makes it possible for you to see your new rooms decorated in a range of colours and other apps also make it possible to record room measurements for curtains and floor coverings. By using modern technology and apps to assist you, you could experience an easier and better informed move.